When it comes to hunger anywhere, children are the worst victims. They didn't ask for the situation, and they are helpless to change it. For as many as 16 million children right here in the U.S., this is a problem that stares them in the face every single day. You can call it food-insecure, or uncertain access, but when there is not enough food on the table to fill a tummy, hunger is plain and simple. According to the U.S. Department of Agriculture, hunger affects about 49 million people in the U.S., of which 16 million are children. Hunger is one bi-product of living in poverty. These states have unemployment rates that are higher than the national average. Many families also live in rural areas where there is limited access to grocery stores or food banks. The high poverty rate in these states also prevent many families from having a car, making it more difficult to have access to food sources. It's hard to imagine such levels of hunger in the U.S. Texas, for example, has four counties out of a total of 15 counties in the nation where 100,000 children do not have enough food to eat. 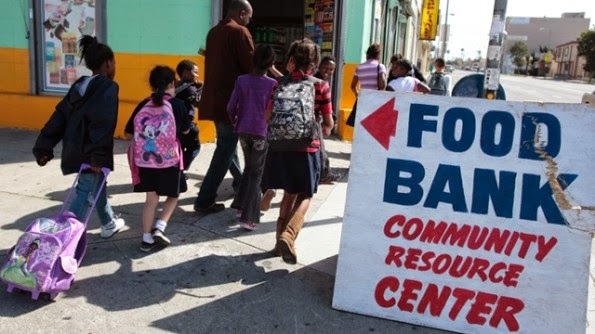 Government programs such as the Supplemental Nutrition Assistance Program (SNAP), the Feeding America Program which is a nation-wide network of food banks, and the free or reduced lunch program makes it possible for children and their families to eat. But in many states, rural schools either do not know about the programs or cannot participate because they don't have the resources.